Welcome to the Spring 2014 Lacrosse season! Parents and players are encouraged to register early and start to complete the preparation steps for the upcoming lacrosse season. You must be registered to receive DHS lacrosse pre-season and in-season information. There is no cost to register, although players making either team are encouraged to contribute to the lacrosse program. When you register, parents will be required to select two volunteer position choices. Be sure to review these positions beforehand. After registering, get ready for the season by reviewing the 2014 LAX calendar, and following the Pre-Season Preparation Steps. 2014-02-10 - 2013-02-13 DHS Boys Tryouts 6:30-8:30 pm at Davis HS. The steps to prepare for the Lacrosse season are the same for both the JV and Varsity players. The following is an overview of steps involved in the preseason process. 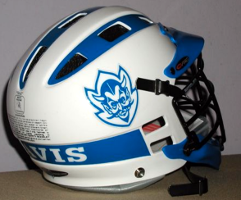 Register All Prospective players are required to register on the Davis Lacrosse Association Website. When you register, parents will be required to select two volunteer position choices. Be sure to review these positions beforehand. DHS Athletic Requirements The Davis Senior High School has a mandatory list of requirements for Spring 2014 athletes. Please see the DHS Athletic Pages for complete information on the requirements for our Spring 2014 athletes. The DHS-ATHLETIC Forms Page contains the required forms players must complete, and the DHS ATHLETIC HANDBOOKS include handbooks describing the player's responsibilities as a student athlete. Students who have not completed these requirements will NOT be allowed to participate in Lacrosse tryouts. Sports Physical Paperwork Night Most student athletes and their parents will want to attend the Spring 2014 Sports Physical Paperwork night to finalize and verify the completion of their required forms to DHS. The DHS Athletic Pages will be updated with dates as they become available. Concussion Baseline Testing Student athletes will need to schedule a time to take their baseline concussion testing. The DHS Athletic Pages will be updated with testing dates for Spring Sports when they become available. DHS Boy's Lacrosse Handbook contains additional information for our lacrosse Student Athletes. The handbook contains an additional form to be submitted at the Parent / Player Meeting. Students need to return this form to be eligible to participate in Lacrosse tryouts. Contribute We request our student athletes to make a contribution towards our lacrosse program. Captain's Practices start December 2nd, and continue until February 7rd, at the DHS stadium field. The tentative schedule is Monday, Wednesday and Friday 4pm to 6pm (under the lights). Tryouts are scheduled for February 10th through 13th, 6:30-8:30 pm at the Davis Senior High School Stadium field. The DHS Athletic's Tryout pages includes the final spring sport schedule. Preparation information is available in the DHS Men's Lacrosse Handbook. In order to sustain our high school boys lacrosse program we request a contribution of $400 per player. Contributions are requested by January 31 prior to tryouts. Once teams are selected the checks will be deposited. For those who have paid but did not make the team, your check will be returned. Player contributions are not required in order to be on the team, but they are the primary funding source for our program. Your contributions go towards the following player expenses: uniforms, team equipment, supplies, coaches salaries and travel expenses, referees for home games, game administration for home games, bookkeeping, equipment replacement and repair, player scholarships, team photos and end-of-year banquet. Conditioning is an important part of Lacrosse preparation. Players can use the Blue Devil Strength and Conditioning Packet and the Lax Calendar 2013/2014 as guidelines for a training schedule in the off season to prepare, as well as during the season to stay on top of the game. Players and Parents should read the Student Athlete Nutrition and Hydration Guidelines. Sleep, proper nutrition, and constant hydration are the keys to enhancing athletic performance. ​Lacrosse is a fast and exciting sport that is wonderful for all spectators. It can be confusing for newcomers to the game, so parents may want to acquaint themselves with the game by reading Lacrosse 101, a brief but engaging introduction to Men's lacrosse. During the course of the season, our tireless volunteers upload wonderful photos to both JV and Varsity shutterfly Accounts. Access information will be provided when the sites are available. This year we plan to make some videos available as well. The players will also be able to access team and personal statistics throughout the game. Jersey’s, pinnie's and shorts are owned by the team and must be returned at the end of season in the condition issued. Players keep their shooter shirts and socks. Players will be responsible for paying to replace lost or destroyed jerseys & pinnies. Replacement cost for each jersey is $60, each pair of shorts is $40 and and the pinnie is $15. Launder the jerseys, shorts and pinnie in cold water, using a mild detergent. HANG DRY; do not place in the dryer. Davis team colors are White and Royal Blue. Helmet colors are White helmet body with Royal Blue bill/visor and Royal Blue chin strap. Cascade brand is recommended. 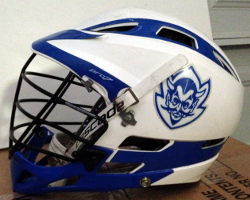 Helmets can be found locally at Lacrosse Fanatic, or on-line. 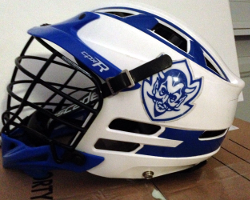 The Blue Devil and team graphics are applied using decal stickers. Helmet decal stickers are required for all players. The uniform committee will have these available for purchase. During registration, it is important to indicate the type and model of helmet your son will be using during the season (Cascade CPV, Cascade Pro7, Cascade CPXR, Cascade R), and if you will need stickers so the appropriate stickers can be ordered. The decals are to be applied exactly as shown in the figure below. Each player must have the following required lacrosse gear including but not limited to: gloves, elbow pads/arm guards, shoulder/rib pads, cup, mouth guard, cleats and stick. Mandatory mouth guards may not be white or clear. Sticks must meet standard lacrosse guidelines. During pre-season parent meetings and after tryouts you will be invited to purchase team spirit wear and warm-up kits. Samples and sizes will be available at the Parent/Athlete meetings. An order form is available for purchases throughout the season.